To observe the tragic 100th birthday of communism, I wrote last week about Karl Marx’s legacy of death, suffering, destruction, and misery. Along with its sister ideology of national socialism, communism was the most potent killer of the 20th century. But what’s really disgusting is that there were people in free nations who made excuses for this evil, totalitarian ideology. I wrote last year, for instance, about the western politicians who favorably eulogized the former dictator of Cuba. Now let’s take a look at another collection of despicable people in the western world who carried water for tyranny and overlooked the horrific death toll of communism. The New York Times, as part of its nostalgic series about the joy of the “red century,” featured a column that romanticized an evil ideology. The people who came to our Bronx apartment or were present at the fund-raising parties we attended, the rallies we went to, and the May Day parades we marched in were all simply progressives. At the kitchen table they drank tea, ate black bread and herring, and talked “issues.” …When these people sat down to talk, Politics sat down with them, Ideas sat down with them; above all, History sat down with them. They spoke and thought within a context that lifted them out of the nameless, faceless obscurity into which they had been born, and gave them the conviction that they had rights as well as obligations. They were not simply the disinherited of the earth, they were proletarians…the party was possessed of a moral authority that lent shape and substance, through its passion for structure and the eloquence of its rhetoric, to an urgent sense of social injustice. …the Marxist vision of world solidarity as translated by the Communist Party induced in the most ordinary of men and women a sense of one’s own humanity that ran deep, made life feel large; large and clarified. It was to this clarity of inner being that so many became not only attached, but addicted. No reward of life, no love nor fame nor wealth, could compete with the experience. To be fair, though, the column at least noted how revelations of Stalin’s brutality caused many to lose faith and abandon the Communist Party. And I guess some of those people had an excuse. Up until the 1950s, very little was known about the horrors unleashed by communism. So I grant that some well-meaning leftists, with legitimate grievances about America’s shortcomings in areas such as race, might channel their passions in the wrong way. But is there any excuse for modern-day communist sympathizers? Consider the contemptible views of Tom Hayden. I would disagree with him if he was a liberal socialist, but he waded deep into the swamp of Marxist socialism. In the 1960s, Hayden helped define and popularize Students for a Democratic Society (SDS)… Newspapers now have produced glowing and inaccurate accounts of Hayden’s life and politics. Most egregious was The New York Times, which started incorrectly by writing that he “burst out of the 1960s counterculture as a radical leader of America’s civil rights and antiwar movements.” …The worst claim in the Times’ obituary is that Hayden was a “peace activist”… He could be called a peace activist only if one views someone who supported a Communist victory in Vietnam as a proponent of “peace.” …On foreign policy, Hayden always supported America’s enemies, be it North Vietnam or Castro’s Cuba. …he referred to the work of the AFL-CIO to fund labor unions in authoritarian and totalitarian regimes, which opposed free labor unions, as part of CIA “covert operations”…he bragged to one and all that he opposed “the secret pro cold-war element within liberalism, directly and indirectly tied to the CIA.” In making these claims, Hayden was using the exact terminology created by the Communists and pro-Soviet fellow-travelers of the Old Left. Here’s a truly bizarre argument from a column in Prospect. The Bolsheviks’ attempt to create a soviet democracy was a bold leap into the future… They acted quickly to end the war, institute workers’ control, and reform land ownership… Within a year, amid counter-revolution and international intervention, the new state was engulfed in civil war, and the bases of terror and authoritarianism were being laid. That failure should be mourned, but the attempt should not. …As liberal democracy proves weak and crisis-ridden in the face of far right challengers, we could do worse than take Walter Benjamin’s “tiger’s leap into the past,” and recover this valuable tradition. I’m a loss for words. The amorality and immorality of someone who pines for a replay of the Russian revolution is beyond comprehension. Speaking of moral blind spots. imagine the twisted thinking that leads someone to write a book extolling communism to children?!? Once upon a time, people yearned to be free of the misery of capitalism. How could their dreams come true? This little book…presents political theory in the simple terms of a children’s story, accompanied by illustrations of lovable little revolutionaries experiencing their political awakening. …Before they know it, readers are learning about the economic history of feudalism, class struggles in capitalism, different ideas of communism, and more. …With an epilogue that goes deeper into the theoretical issues behind the story, this book is perfect for all ages and all who desire a better world. For what it’s worth, I prefer the Obama version of socialism for kids. Writing for National Review, John O’Sullivan mentions some of the morally blind people in the west, especially the awful crowd running the U.K. Labour Party. Douglas Murray expands on this theme in another article for National Review. …the celebrated historian Eric Hobsbawm, who remained in the Communist Party even after the invasions of Hungary and Czechoslovakia and earned his place in infamy in 1994 by saying in an interview that, yes, if another 20 million deaths had been necessary to achieve the socialist utopia of his dreams, then 20 million deaths would have been fine by him. …It is over the genocide in Cambodia that America’s most cited public intellectual, Noam Chomsky, retains some notoriety. As reports of Pol Pot’s genocide emerged, Chomsky was one of those who wished to ignore the reporters accurately describing what was happening. …in Britain, Diane Abbott, a prominent Labour backbencher in Parliament…said in passing that “on balance Mao did more good than harm.” …shadow chancellor, John McDonnell, stood at the dispatch box in the House of Commons and waved a copy of Mao’s “Red Book” to give the Conservatives some lessons in economics. Last but not least, consider the reprehensible decision of a senior minister from the Greek government. A decision by Justice Minister Stavros Kontonis to turn down an invitation to participate in an international conference on crimes committed by communist regimes. Understandably, an Estonia minister had a very strong response to the vapid preening of his Greek counterpart. Let’s also not forget the morally bankrupt apologists for the quasi-Marxist Venezuelan dictatorship. And I suppose Crazy Bernie deserves a mention as well. I’ll close by observing that it should be the role of all decent people to condemn all forms of totalitarianism. Frankly, I’m not interested in the debate over whether communism was worse than Nazism, or vice-versa. Why can’t we simply agree that both were awful and that those who make excuses for either should be shunned by all decent people? Be honest, Sebastian. Yes, communism was supposed to be classless and stateless. But it’s also a utopian vision that is impossible to achieve. The path to communist utopia first runs through massive oppression by a massive state. 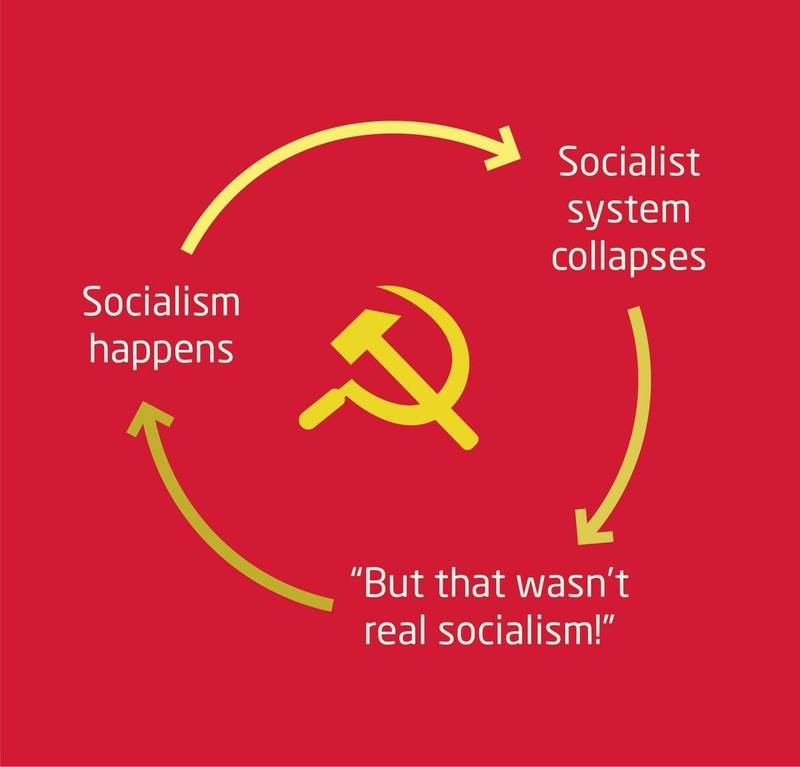 Every single time people have started on the road to communism, they have failed. In the process, they have killed millions and oppressed even more millions. No one – no one – has ever emerged on the other side that is supposed to be a stateless utopia. How much real-world evidence do you need? How many more people need to be killed and oppressed before communist dreamers give up the dream? No. Communism is contrary to logic, human nature, and empirical evidence. The “non ideal circumstances” under which the communist experiment was conducted are human nature itself. Your cousins and close friends? While many people might answer close to 100% to the first, most people drop in the low single digits by the time they get to cousins and close friends on the list. Therefore, because communism goes against basic human nature, it has to become coercive, and that is why virtually all communist countries are dictatorships. It’s not a coincidence or a case of bad execution. The communist experiment itself is destined to fail at its core. Even if you could somehow implement communism without brutal coercion (for example France may be a quarter to half-way there), the resulting lack of enthusiasm and creativity would quickly result in low growth and doom for the country that implements it (or the majority that manages to impose it) — especially in the twenty first century where humanity has entered an era of irreversible exponential growth — and accelerating. The best hope for communism is something that the left hates: genetic engineering– of humans! That is, genetically engineer humans that remain highly motivated producers even when most of their reward is nationalized and dispersed. You don’t even know what communism is or the source of the 100 million deaths lie. Please start reading serious books. Communism is not totalitarian, quiet the opposite, for it is a classless, moneyless and statess society. You are talking about forms of state capitalism under totalitarian quasi-leftist-fascist regimes. There are a lot of people misusing political labels these days, and there’s one great book that debunks them all. Anyone who believes that fascism or Nazism is associated with the right wing (or libertarians) needs to read The Big Lie by Dinesh d’Souza. 10/10.